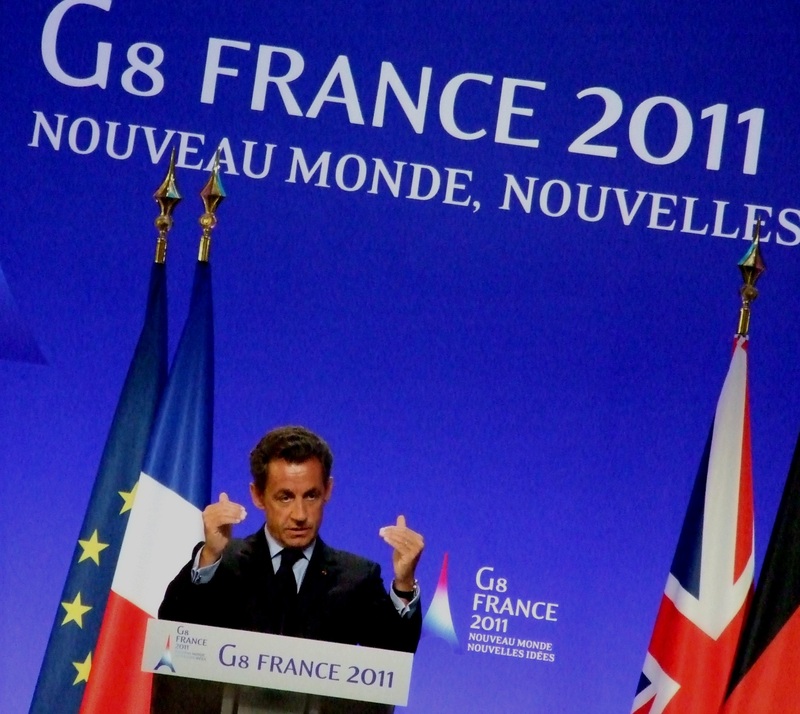 French President Sarkozy at a G8 press conference. DEAUVILLE, France — Nothing of significance for global health came out of the G8 Summit that concluded here Friday. We expected little, and the G8 lived up to our expectations. Overall, the NGO community found the Deauville Declaration, in the words of Sherpa Times, “vague, confused and lacking any sort of concrete advances on the main issues.” Most NGOs had criticized the Deauville Accountability Report, on global health and food security, as lacking in clarity and honesty. The Global Health Council, in our official reaction to the Deauville Declaration, was kinder than most. We said the GHC “welcomes the G8 leaders’ reaffirmation of their commitment to global health as expressed in their Deauville G8 Declaration and urges them to live up to the promises of the declaration and to track their implementation in a fully transparent manner.” Frankly, we were vastly relieved that the declaration did address global health, and reaffirmed previous commitments, specifically, the Muskoka Initiative, the Global Fund to Fight AIDS, TB and Malaria, and the GAVI Alliance, which is holding its replenishment conference in London next week. But we also pointed out the significant criticism the G8 has received over its Deauville Accountability Report where it reportedly inflated the foreign aid it has delivered since the Gleneagles Summit of 2005. And we pointed out that the Deauville Declaration all but declared that its critics were correct in saying that there is a $19 billion gap in constant dollars between the development assistance that the G8 and other donors promised to deliver and what was actually delivered in those five years. My last blog from Deauville gave credit for that remarkable candor in the declaration to British Prime Minister David Cameron, my new G8 hero, for calling out the G8 for its lack of accountability and his fellow heads of state for not making international development more of an issue. The issue that very much dominated this summit in the mainstream media — both French and international — was aid to the emerging Arab democracies of Egypt and Tunisia. This trend was dubbed “Arab Spring,” or “les Printemps Arabes,” and was undoubtedly the most common phrase in media coverage of the summit. G8 leaders announced plans for $40 billion in aid for the emerging democracies — $10 billion from the G8 itself, $10 billion from wealthy Arab countries like Saudi Arabia and $20 billion from multilateral agencies like the World Bank. But Christi Parsons of the Los Angeles Times reported the view that many of us in civil society held: If the G8 is still $19 billion short of the $50 billion they committed to deliver to developing countries by 2010, why should we believe that they are now sincere about committing $40 billion more for the Arab Spring? And also — unspoken but surely contemplated by the NGOs — will this new $40 billion commitment further compromise, or negate, the G8’s ability to meet the existing $50 billion commitment of Gleneagles 2005? Except for Cameron and Harper, I heard no head of state mention global health, or even international development. I sat through two press conferences of French President Nicholas Sarkozy and heard him make only one comment on these issues, a brief reference to his commitment to innovative financing for development (and indeed, he is a champion on this issue, although it was not evident in Deauville). Of particular note was the very low profile of HIV/AIDS in contrast to past summits. Yes, it’s true that French First Lady Carla Bruni-Sarkozy, who is also the global ambassador for the Protection of Mothers and Children against HIV/AIDS, gave a working lunch Friday for G8 spouses on the protection of mothers and children against AIDS. But I saw no statement or media coverage of that lunch. No G8 leader save Cameron made any mention of HIV/AIDS. And there were opportunities for journalists to engage on the issue. In addition to the spouses’ working lunch, Global Fund Executive Director Michel Kazatchkine and UNAIDS Executive Director Michel Sidibé made a compelling case for “this historic opportunity to eliminate mother-to-child transmission” in a press conference. Sidibé even made the economic case for elimination. Unfortunately, this press conference attracted all of 10 people (not including myself). Someone later told me that only two of these were legitimate journalists; the rest were NGO representatives like us. How do we get old issues like HIV/AIDS and new issues like maternal and child health (not to mention non-communicable diseases) more firmly on the G8 agenda? And is there any hope of getting these issues on the G20 agenda? France is also hosting the G20 this year five months from now. If these issues do not come out strongly at the G8 — their traditional venue — how do we expect them to get any traction on the G20 agenda? Thank you, David, for the excellent roundups of the Deauville Summit, and particularly for your thought provoking questions about placing HIV/AIDS and other global health issues more prominently on the G8/G20 agendas. It can be argued that the 2010 Muskoka [G8] Accountability Report suggests that the collective thinking of the G8 was to signal it was apologetically closing the door on the 2005 Gleneagles commitments — including the groundbreaking ones on global health and development assistance. It is unconscionable that scarcely a year after failing to live up to its promise to provide universal access to HIV prevention, treatment, care and support by 2010, the G8 says nary a word about AIDS. But it was just plain stupid to try to “cook the books” by vastly lowballing the real ODA contributions of its members. Still the outcomes should not be surprising because the retreat from Gleneagles went largely uncontested outside those of us who follow these things. Next year may be more of the same unless global health advocates and their development allies renew the energy and put to use the advocacy skills that produced the astonishing pre-Gleneagles results. It not a matter of needing to figure out what needs to be done, we just need to do it again. Next year, with the U.S. holding the G8 Presidency, we will have our chance. What about the G20? Despite the undeniable and undisputed linkage between economic growth and development — especially global health — there is little reason to hope that the G20 will ever serve as an alternative to the G8. Why? Because the main players are the finance ministers and their central banks colleagues who have long histories of wrongheadedly thwarting health and development initiatives. On the other hand, there is plenty of room to tinker on the margins of issues the G20 does take up to improve the prospects for better global health outcomes. One area worth considering is to turn the tables a bit by seeking G20 communique language that imposes conditionalities on the World Bank and IMF — say by requiring health impact studies on all of their infrastructure projects with required mitigation measures to offset project-induced health consequences. At the very least international financial institutions should do no harm. And of course, there is also considerable revenue generating potential in the G20. Neither the G8/G20 have done what they should, but we should also accept the blame for not making them do the right thing. FDR once listened to the prominent civil rights leader of his day go on at length about what needed to be done to help African-Americans. He then looked the man in the eye and said, “I agree with everything you have said. Now your job is to make me do it.” After fits and starts and eventually sustained effort, the man lived to see what he spoke to FDR about — more than twenty years later.